Sen. Bernie Sanders made his first campaign stop in Connecticut on Sunday evening. The Democratic candidate took the stage at a rally before a crowd of about 10,000 people on the New Haven Green just after 7 p.m. 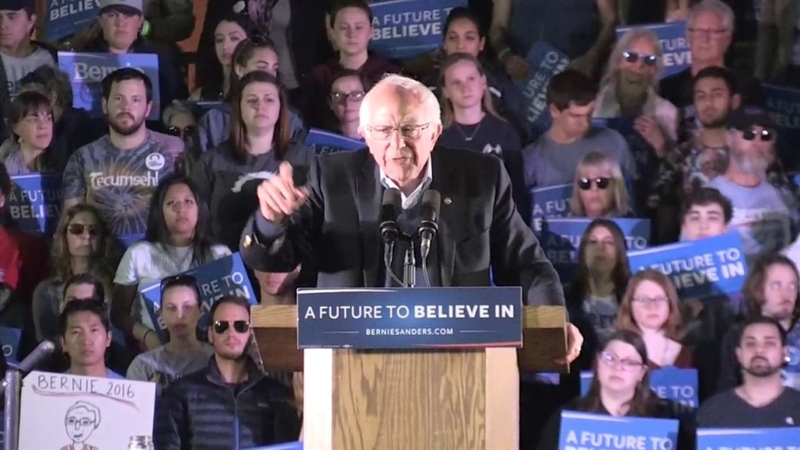 The Vermont senator talked about the need to make college more affordable for everyone. "Why are we punishing millions of people for getting an education?" Sanders asked about Americans who spend years paying off student debt. "We must make public colleges and universities tuition-free. This is not a radical idea," he said. "People should not have their economic future destroyed because they went to college." Sanders told the crowd that something needs to be done about what he called the epidemic of opiate and heroin addiction. He called for a revolution in mental health treatment and used the topic to take a shot at Connecticut Gov. Dannel Malloy, a Democrat. "When people need mental health treatment they get it today, not six months from now," Sanders said. "Now in that context, I'm not quite sure why your governor has cut mental health treatment in Connecticut." According to a recent Quinnipiac Poll, Sanders trails Hillary Clinton among likely voters in Tuesday's presidential primary. Sanders is also expected to make an appearance in Hartford on Monday. The rally will take place at Mortensen Riverfront Plaza in the Riverfront Amphitheater at 300 Columbus Boulevard at 10 a.m.
Organizers said the event is free and open to the public, but admission is first come, first served. Carpooling or public transportation is strongly encouraged.